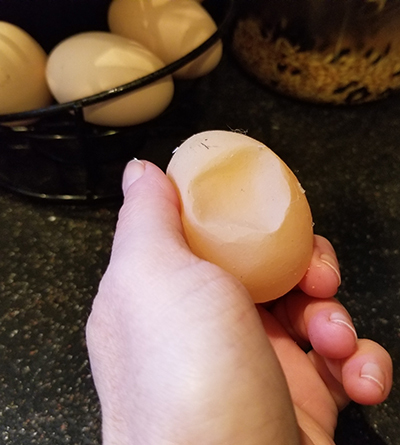 At the end of January last year (2018), we got our first egg ever from our chickens. It was from our oldest hen, Lucy, a Rhode Island Red, who incidentally is the best chicken ever. I still remember how excited I was when I opened the egg hutch to check as I had been compulsively doing for the past week when we first gave them access to the nesting boxes in anticipation of her starting to lay. I was expecting it, but not expecting it all at the same time! It was such a fun and exciting feeling that anyone who is experiencing it with their new flock will tell you. All the girls soon followed and all are good layers, and after April when they started laying, we were getting 4-6 eggs a day from our six-pack flock. Check out our Top 7 Winter Tips for Backyard Chickens! Betty had a full, hard molt. The first and only one to do so thus far. But Betty’s molt was quick, albeit ugly, and she’s growing her new, gorgeous feathers like a champ. It’s a fascinating process to witness. And she’s managed to go through it in just a few weeks. This is great, because first of all, it’s winter (even though it’s Raleigh, it still gets cold) and it also signifies that she will be a great layer. But we already knew that. During Betty’s molt, especially when she was half naked and sad looking, she would intentionally isolate herself. I would bring extra protein out to the girls, mostly for her, but she wouldn’t try to get anything with all the girls huddled around the dish. So I would throw pieces of meat just to her, while throwing meat to the others in a different direction. She looks so sad & miserable! 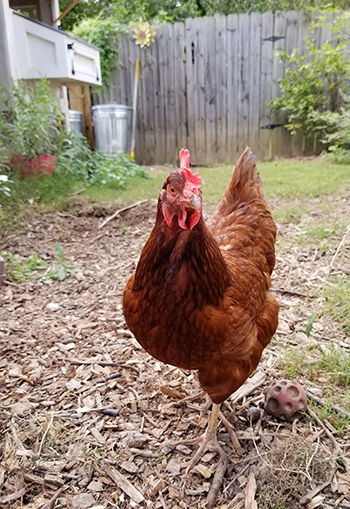 Betty lost her bossy mojo during her molt (plus there was the coup last fall, where Louise moved up the pecking order at Betty’s expense). So I made sure she would get a good amount of protein that she desperately needed to grow new feathers. Yogurt, black oil sunflower seeds, meat scraps, and mealworms are all great protein sources. I used canned tuna fish (thank you Instagram follower who suggested that one!) and some leftovers (which are scarce in our house with two dogs). 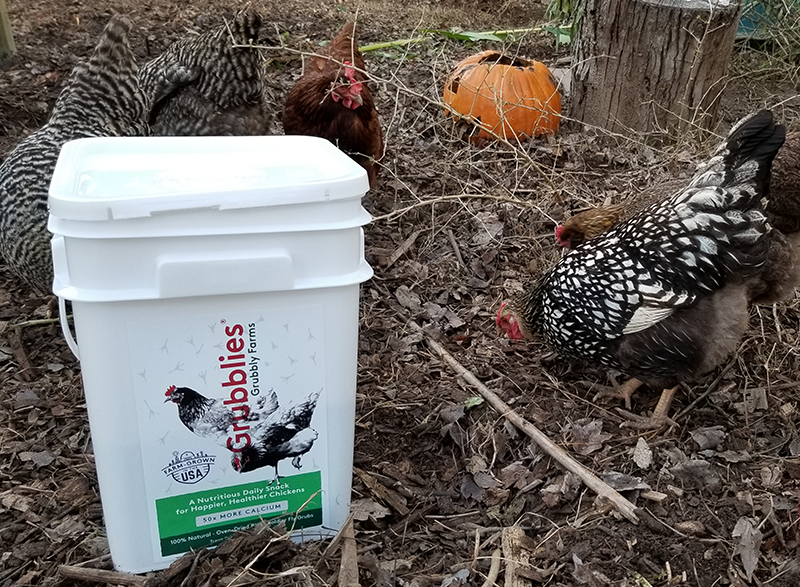 I also discovered Grubblies from Grubbly Farm, which is black soldier fly larva and that has become the new chicken crack in my flock. Seriously, I cannot be without them now, molting or no molting. Some of our other birds are going through a slower and less severe molt. 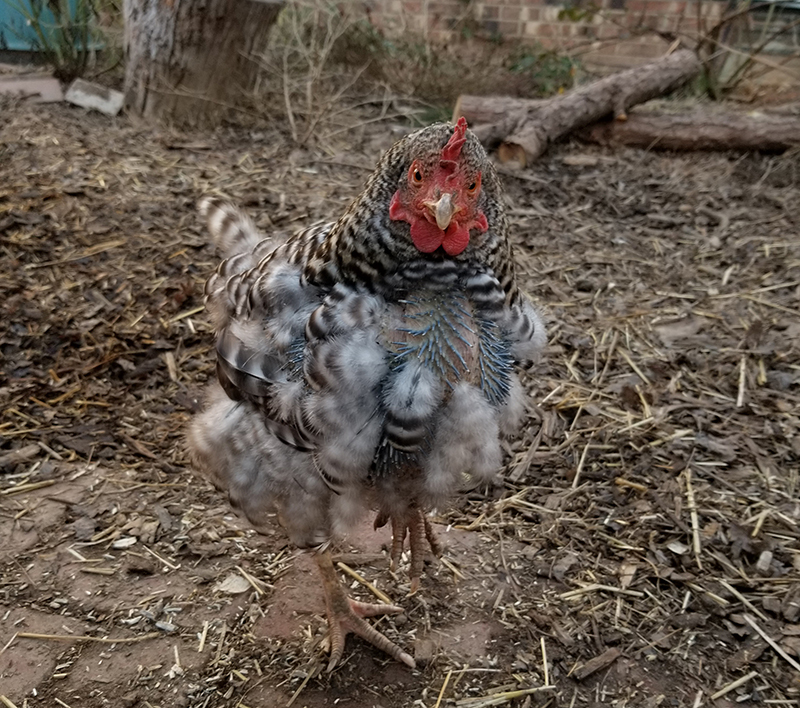 Hazel, the Easter Egger, is losing a lot of feathers from underneath, but it’s not following the same distinct molting pattern that Betty and most chickens do; which is molting from head to tail. Maude, the Silver Laced Wyandotte is also showing some molting feather loss as is Louise, the Buff Orpington. What I find most fascinating though is Wilma, who most likely hatched from the same clutch as Betty, and definitely at the same time, did not molt. Sure, she lost a few more feathers than normal, but she shows little or no signs of molting. Lucy, the queen, also didn’t really molt. Some feather loss, but nothing major. Betty, also being such a trooper, managed to lay 3 soft eggs during the end of her molt. Let me explain. On three separate occasions, I found a soft egg in the henhouse, under where Betty (and the rest) roost. What happened, I’m surmising, is that her body is getting ready to produce eggs again, but she hasn’t had the instinct to seek out the calcium she needs to produce a hard shell, nor is her egg cycle coming during the day, when she would instinctively go into the nest box. So, during the night, out pops this weird, intact, soft shelled egg. I’ve gotten the occasional soft shelled egg when they all started laying. Most times it would occur over night, as it was probably unexpected for the chicken. Chickens, like all animals, have wonderful instincts that tell them what they need and when they need it. Our job, as chicken keepers, is to ensure they are have access to these things. I always make sure they have oyster shells available to them in their run. Plus I bake and crush their egg shells and give them that as well. I know what some people are thinking, ‘doesn’t that encourage egg eating?’ No, not if the shells are broken up small enough that they don’t resemble eggs anymore. If you chickens are eating their own eggs, it could signify something missing in their diet or environment, so it may be another issue entirely. 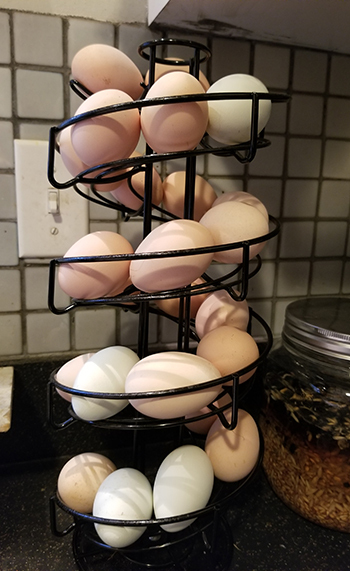 I’ve been feeding my flock eggs shells since they started laying and they have never eaten any of their own eggs, even when they end up being an egg laid overnight and lands in the henhouse. We are hoping to not ever buy eggs again from the supermarket, so we were kind of hoarding our eggs this winter. Hazel is also molting slightly and hasn’t laid in weeks, which is easy to tell because she lays blue eggs. Betty hasn’t resumed her egg laying schedule yet. However, I still find 4 eggs in the nest box on most days. So, hopefully, with the right diet and extra protein to help feather regrowth, and lots of fun foraging, my girls will continue to be healthy, happy chickens. Honestly, their bodies need a rest from egg laying, I get it, and I completely understand if they all stop laying altogether. But either because of their ages or breeds, the geography of where they live, they are staggering their rests, and we are lucky enough to continue to get eggs throughout the winter. I continue to be entertained and fascinated by my chickens, the change in pecking order, their distinct personalities, and how they interact with people and each other. 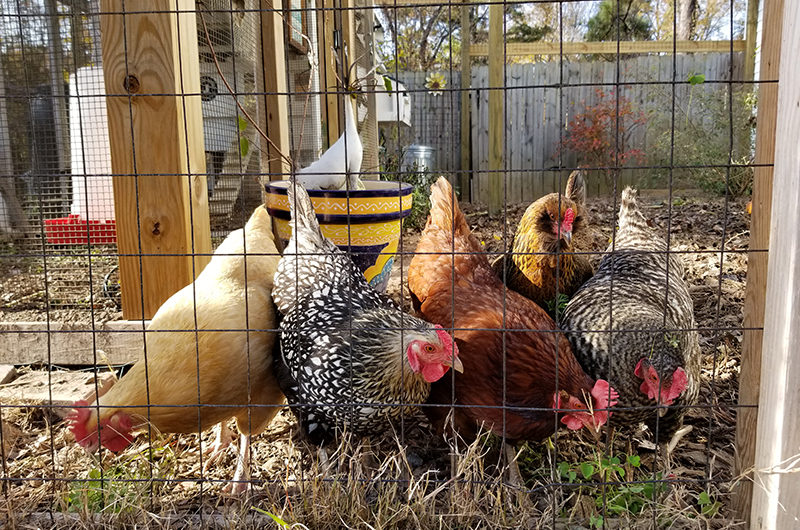 We are trying to resist getting more chickens right now because we want to stagger our egg laying within our flock and we don’t want to max out our henhouse either. We plan on keeping our girls even when they stop laying eggs. They have been so good to us and we really feel like they are our pets, so it’s an easy choice for us.